Toyota and Honda are the dominant players in the Environmental Protection Agency's greenhouse gas reduction program. Here's how they did compared to other automakers. The Environmental Protection Agency (EPA) has just released its latest report on fuel efficiency and emissions in the U.S. auto industry. Overall, the news is good. Automakers are setting records for both increases in fuel efficiency and also emissions reduction. One part of the long and very detailed report that caught our eye was the latest results of the greenhouse gas compliance program. In a nutshell, Toyota and Honda are dominating the positive results from this important new program. The greenhouse gas (GHG) reduction program was started in 2010. The GHG program is a credit-based averaging, banking, and trading (ABT) program that evaluates the annual performance of every auto manufacturer against increasingly difficult standards based on the vehicles each manufacturer sells. The program has goals tailored to the manufacturer, rather than a single goal for all to meet. This method of goals was intended to make it fair for those automakers who primarily built larger vehicles. Since each manufacturer's' goals were based on its existing portfolio of products, the EPA established a way for each automaker to improve its particular fleet. As out top of page shart shows, Toyota is dominating this program and Honda is also doing quite well. The results shown at the top of the page are how many extra credits the automakers had as of the report creation in October of 2018. It is the most up to date data available. 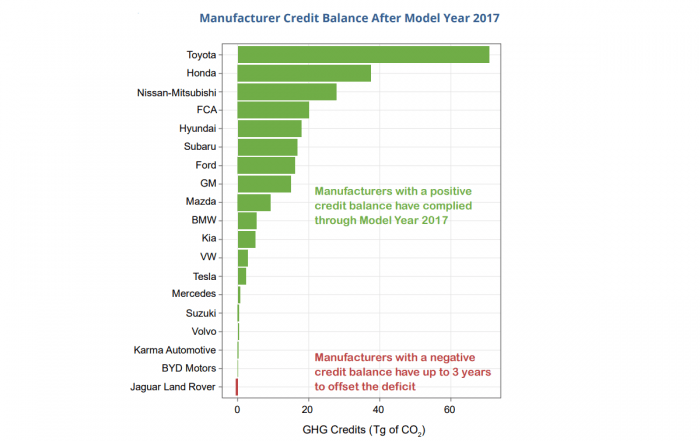 What seems obvious is that Toyota and Honda are the key net sellers of GHG credits to automakers that cannot keep pace with their own goals. Tesla also does well. Tesla has no vehicles that create emissions and thus has only a positive balance of credits that it can sell. Toyota and Honda both lead in affordable electric vehicles like the Prius Prime and Clarity PHEV. These vehicles help to earn automakers credits to offset the heavy emitters in their portfolio that are not making gains towards their reduction goals. Both Toyota and Honda are doing very well in this regard. As of the last data, which measured 2017 model year vehicles, General Motors was at about break even, despite having the most EVs by far during that timeframe. Please don't take our coverage of the EPA report at face value. You can read the full report from the EPA here and we encourage you to challenge our findings and comment on those you feel are most important.